In existence from the 150 B.C. 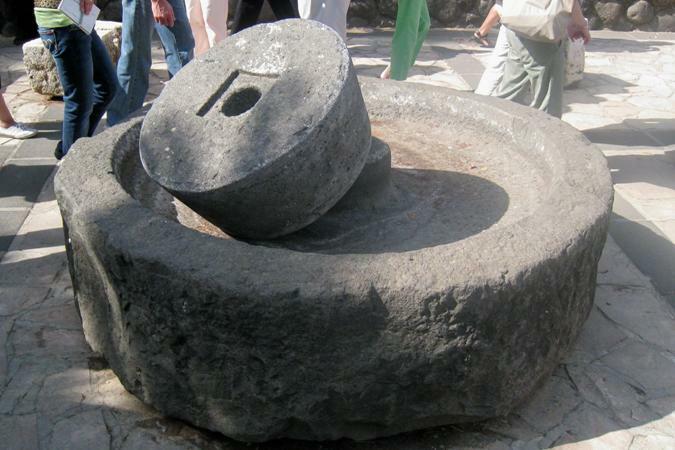 to 750 A.D., Capernaum was a city built along the edge of the Sea of Galilee. The town, which Matthew in his Gospel refers to as Jesus’ “own city” (Matthew 9:1) is not mentioned in the Old Testament. Located on the highway from the Mediterranean coast to Damascus, the Via Maris, merchants would bring silk and spices from Damascus, and take back the dried fish and fruits of the plains of Gennessaret – another name for the Sea of Galilee. It was home to approximately 1500 people during the time of Christ. Although it was a center of trade and commerce, fishing was the town’s major industry and many residents engaged in supporting enterprises such as tying fishnets and repairing boats. Jesus made Capernaum His home and headquarters during the three years of His ministry. In Matthew 4: 13 we read, “Leaving Nazareth He went and lived in Capernaum.” The four Gospels repeatedly mention Capernaum as His dwelling place or headquarters after He abandoned Nazareth. He often returned to the town, after preaching in the countryside along the northern shore of the Sea of Galilee, as a guest of His disciple Peter and his wife, whom we meet in 1 Corinthians 9: 5. In the 1 Corinthians passage, Paul attests to Peter having a wife, a believing one at that, who accompanied him on his travels. Presumably, Peter’s mother-in-law also resided in the house for in Mark 1:30-31, Matthew 8: 14 – 15, Luke 4: 38 – 39, we read that Jesus cured her of a fever and after feeling better, she began to wait on Jesus, Peter, his brother Andrew, and the brothers James and John who also made their home in Capernaum. Peter’s house is a large part of Capernaum; excavations reveal that this residence, which most believe to be the house of Peter, stood out from the others. Jesus was well known in the region. The Gospels record many events in and around Capernaum. He was confronted by a demoniac while teaching in the synagogue there(Luke 4: 33, Mark 1: 21- 28). He healed the man that was lowered by friends through the roof of a house where He was staying in Capernaum(Mark 2: 1 – 12), and from Capernaum Jesus chose His first four disciples, Peter, Andrew and the two sons of Zebedee, James and John (Matthew 4: 12 – 22). Later He chose the tax collector Matthew, also known as Levi, as a disciple (Matthew 9:9 &Mark 2:14; & Luke 5:27). Matthew, who became the author of the first Gospel, worked at the customs house in Capernaum, performing duties for the Romans, such as collecting tolls and levies from merchants and taxing the fishermen who worked on the waters of the Sea of Galilee. Modern archaeology, something in which the Israelis are extremely adept, confirms Gospel accounts that the Romans garrisoned troops at Capernaum. 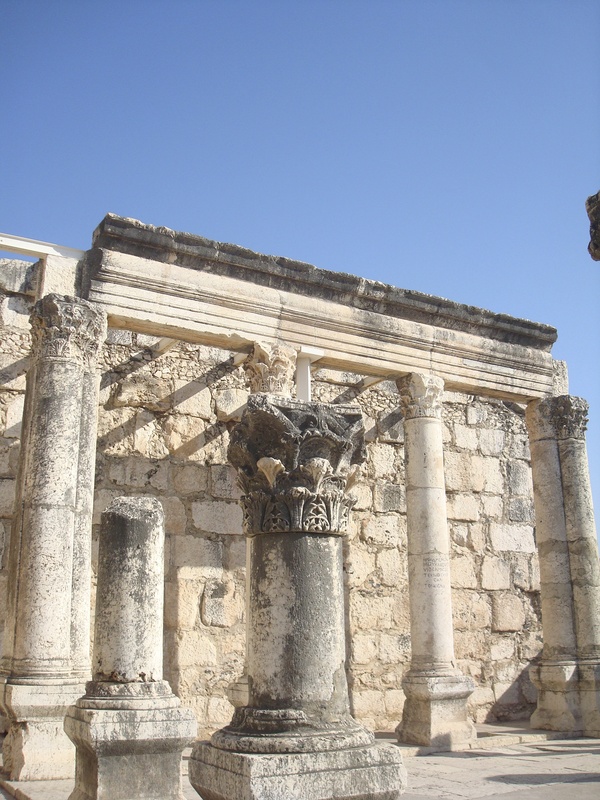 Luke, in chapter 7:5 (also Matthew 8: 5 – 13) of his Gospel, writes that one of the Roman Centurions built the synagogue in Capernaum after Jesus healed his servant. The first synagogue does not exist anymore, but as archaeologists have shown in recent digs, it lies buried under the present synagogue and the black basalt rocks from the foundation of first synagogue are visible today. 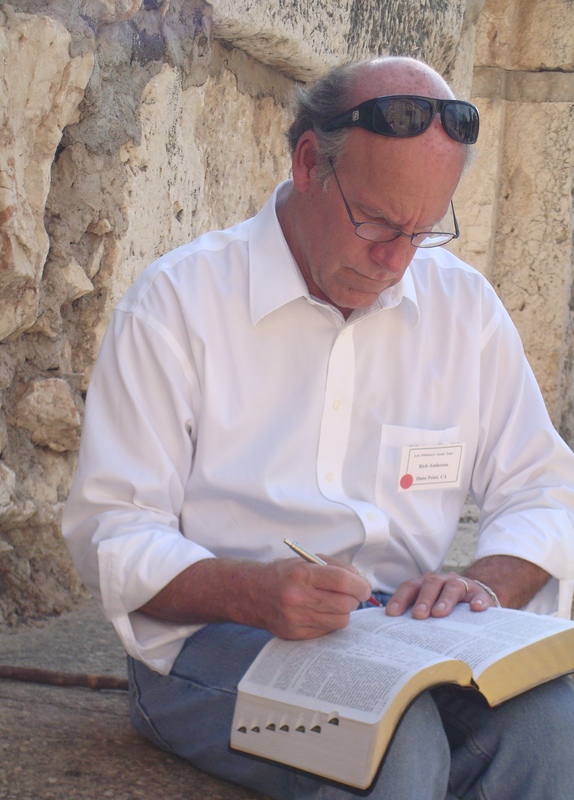 Luke 4: 31 tell us that Jesus taught in the Capernaum synagogue every Sabbath day. In John 6: 22 – 59 we read Jesus’ sermon where he revealed that He was the Bread of Life, and verse 59 specifically states it was delivered at the Capernaum synagogue. 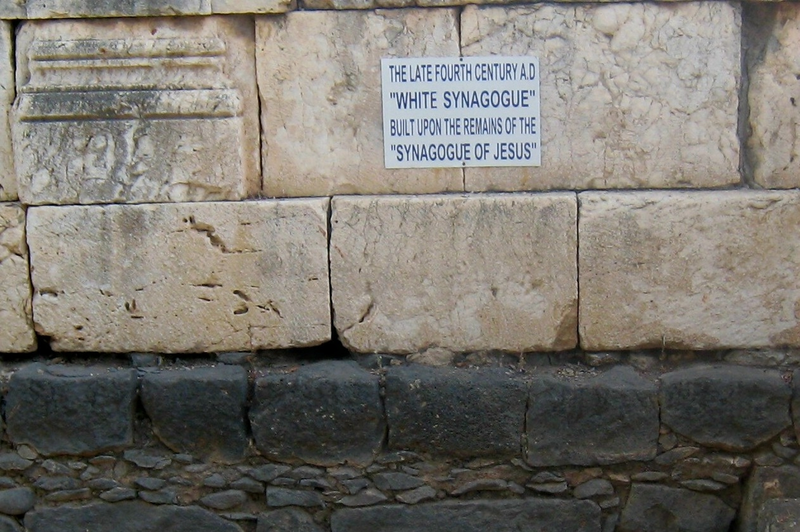 The walls, preserved up to 3 feet high including the entire western wall, still exist and were used as the foundation for a synagogue dated to a later time. Therefore, when you stand there, you are truly standing in a place where Jesus worshipped His Father and taught His Gospel. 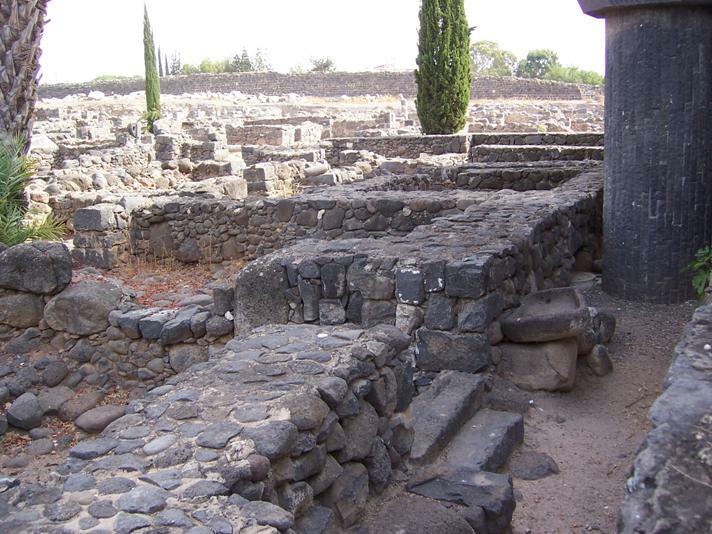 While the dating of the synagogue in Capernaum is debated, (excavations have revealed walls made of worked stone and four feet thick) that Jesus walked, taught, and lived here is not questioned at all. 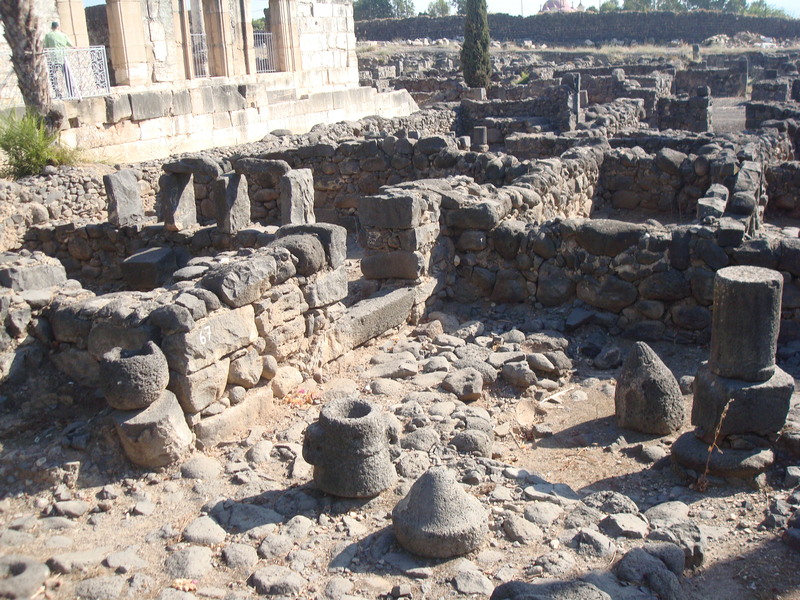 The earthquake of 746 AD sent Capernaum into a decline and it soon turned back into a fisherman’s village.